Accent (noun): can be an accent of speech; an attitude; a stance. It is a distinctive mode of pronunciation of a language, esp. one associated with a particular nation, locality, or social class. 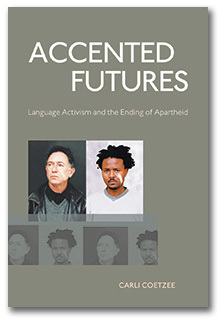 Accentedness, in the context of this book, is a form of activism; a hyper awareness of the legacies of South Africa’s past, without attempting to empty out or gloss over the conflicts and violence that may exist under the surface. “Accented thinking”, in Carli Coetzee’s words, is a tolerance for difference and disagreement, and a willingness to show vulnerability at the same time as taking up resistant and challenging positions. Is this tolerance and willingness to engage with one another, practiced in our literary and political discourse? How can acknowledging difference be helpful in creating a better society?